This is the seventh year in a row that the Legislature has come to work in January with a substantial budget gap to close. On top of that, we are working on closing the gap with much less help from the federal government. Never before has the federal government left the states to fix deep fissures in their funding without extra assistance. The costs associated with providing basic needs are rising and federal matches are falling, leaving us to tighten our belts even more at a time when we are still trying to recover from the recession. This year’s negotiations have been extremely painful and the emails and phone calls we have received have reflected that reality. And yet — we continue to accomplish some amazing things in this state. 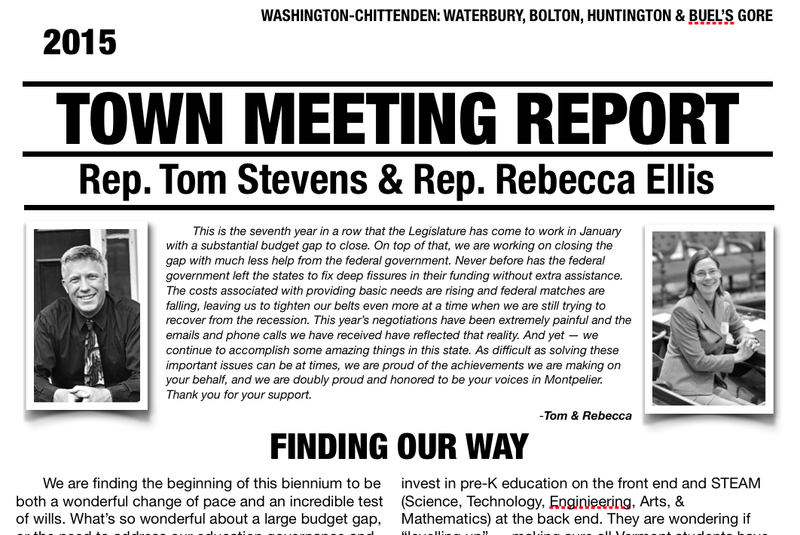 As difficult as solving these important issues can be at times, we are proud of the achievements we are making on your behalf, and we are doubly proud and honored to be your voices in Montpelier. Thank you for your support. We are finding the beginning of this biennium to be both a wonderful change of pace and an incredible test of wills. What’s so wonderful about a large budget gap, or the need to address our education governance and finance systems? Well, believe it or not, we are actually working on some of these issues from positions of strength — our systems have been developed over the years in ways that have provided us with strong foundations. Vermonters know that, despite the effects of the recession and the havoc wreaked on our budgets that we have an educational system that is the envy of most states in the union. Vermonters know that the small size of our state allows us to do things that other states can’t consider, but we also realize that our size limits our financial options. There have been a number of changes in our committee make up. Many of the committees have a number of new members — Tom’s has five new members out of eight and Rebecca’s has seven of eleven, and a good number of these are first year representatives. Teaching new members the parameters and background of the work of each of our committees is exciting and time consuming, and the new members bring a new energy to the process. Speaker of the House Shap Smith has also reconfigured the Education Committee so that they will work on both policy and financing. This difference will bring an excellent unity to the discussions surrounding education. What will happen in the education discussion? It’s too early to tell, of course, and it may be a full two year conversation. The committee has taken nonstop testimony and is examining everything from the Brigham decision to the elegant if complicated financing system. They are investigating whether consolidation can work across the state, or if targeting the smallest schools or districts will provide not only equal access to education but to a quality education. They are studying reams of printouts that will help them determine whether we can provide a better education with less money, and how that may affect the numbers and quality of teachers, all the while hoping we can invest in pre-K education on the front end and STEAM (science, technology, engineering, arts, mathematics) at the back end. They are wondering if “levelling up” — making sure all Vermont students have access to similar programming — means spending more money in every district or if it will provide savings in some. This is the deepest dive into our educational system since the Supreme Court ruled on Brigham, and it is a difficult conversation. As good as our system is — and it is — we are seeing some fraying on the edges because communities are budgeting as tightly as they can and, yet, are seeing some astronomical increases in their property taxes. In the recent past, the number of towns experiencing this phenomenon was limited, but we are seeing more and more towns trying to work out this difficult reality. As we mentioned earlier, the budget gap is another area of strong concern. It is a gap and not a deficit, because while Vermont law allows us to create a budget with deficits, we have not, in recent history, done so. The gap is the difference between expected revenues and expected expenditures. The immediate gap comes from the lag in income taxes since the recession. While our unemployment numbers are better than the national ones — 4.3% in December — we have not witnessed the expected increase in income, which means the wages of the people working are lower than they should be. This may mean a shift from construction jobs to those in service, or folks working two low wage jobs to make up for their pre-recession wages. We know that the income brackets of the 300,000 Vermonters who make under $100,000 annually have seen a minimal increase in their wages since 2009, and those who make over $300,000 have seen their wages increase over 70%. Additionally, those at the upper end of the economic spectrum end up paying a smaller percentage of their income in taxes than those and the middle and lower end. Our Ways and Means Committee is looking into ways we can smooth out this inequity in a way that provides relief to many and doesn’t overtly penalize those who can best afford an increase in taxes. On the other side of the ledger, there is good news. Our recent improvements in developing our renewable energy portfolio has reaped real benefits for electricity rate payers. And because we retained electricity regulation, our electrical rates are the lowest in this region. We have seen Massachusetts electric companies raise their rates over 30% while ours have gone down nearly 2%. Another bright spot is our adjustment in our renewable energy programs. We adopted standards several years ago that increased our investments in renewable energy, and allowed for renewable energy use to grow beyond our expectations. But our current program is now dated. H.40 is a bill that will create a “Renewable Energy Standard and Energy Transformation (RESET) Program.” Twenty-nine states, including every other New England state except Vermont, have renewable portfolio standards. Renewable portfolio standards require electric utilities to include renewable generation in their portfolios, and to sell renewable energy to their customers. The demand for renewable energy is spread throughout the region using renewable energy credits (RECs), which can be purchased and sold by utilities to satisfy the renewable requirements. With its strong renewable energy sector, Vermont has traditionally been an exporter of renewable energy credits. In 2014, Vermont utilities sold roughly $50 million of renewable energy credits, over total revenue of about $830 million. Vermont needs a renewable portfolio standard now because the viability of Vermont’s RECs have been put into question. If New England states disallow the purchase of Vermont RECs due to the absence of a Vermont renewable portfolio standard, Vermont utilities may suddenly find themselves $50 million short on revenues, which would result in an immediate 6% increase in electricity rates. H.40 goes beyond other states’ renewable portfolio standards by creating a unique energy transformation tier which will help reduce greenhouse gas emissions and save money on energy bills. Together these initiatives are known as Vermont’s Renewable Energy Standard and Energy Transformation (RESET) Program. Vermont’s energy transformation tier focuses on total energy consumption, which includes electricity, heat, and transportation. The energy transformation tier lets electric utilities take credit for technology that reduces greenhouse gas emissions, reduces fossil fuel consumption, and saves money. Examples of energy transformation projects include home weatherization, electric vehicle charging stations, and cold-weather heat pumps. The Vermont Public Service Department anticipates that utilities, through the RESET program, will provide weatherization or cold-weather heat pumps to more than 85,000 homes and businesses over the 15 years of the program. And, as a result of RESET, Vermonters will save $275 million in overall energy bills as a result of better demand management. Over the past two years, our legislative website has become more transparent and, this year, much more user friendly. Driven by the desire to save on paper (imagine a committee of 11 receiving numerous drafts of 25 page bills over the course of a session versus being able to call them up on a computer or iPad) and to make our work more accessible, the state has invested in making the public information we receive easier to search for and find online. If education reform is your cup of tea, the House Education Committee’s webpage gives you access to all of the same handouts or copies of testimony received by the committee. By doing so, you can begin to glean the depth of difficulty involved with trying to balance governance reforms with finance reforms, not to mention with trying to enhance achievement of successful educational outcomes. If you are concerned with the legislation surrounding background checks, you can visit the Senate Judiciary page to read supporting or dissenting documents or search from the Legislature home page for the text of the bill. As we mentioned at the beginning this report, this is shaping up to be one of the most difficult sessions we have experienced on your behalf. Vermont will survive — in fact, we already know we will be in better shape than most of our neighbors because of the work we have done over the years in shoring up our foundations. Our work in renewables has already saved us tens of millions of dollars in electrical rates, our Blueprint for Health is bending the curve on medical expenditures, and our commitments to our students puts our public schools in the top ranks nationwide. None of these areas is perfect, of course, and we strive to improve them every day. To do so, we embrace your help, your thoughts and your opinions. We encourage you to read along with us. We receive a lot of phone calls and emails discussing these topics and when we respond with the links for these sites, most folks are pleased that we can provide this information. Our decision making process often seems to be shrouded in mystery only because there is so much going on at the same time. Visit our website, find our committees, search for the issues you are interested in, spend your snowy nights reading and let us know what you think. Filed under General, News, Policy, Writings.